The first field study on the impact of light on teenagers’ sleeping habits finds that insufficient daily morning light exposure contributes to teenagers not getting enough sleep. “As teenagers spend more time indoors, they miss out on essential morning light needed to stimulate the body’s 24-hour biological system, which regulates the sleep/wake cycle,” reports Mariana Figueiro, Ph.D., Assistant Professor and Program Director at Rensselaer Polytechnic Institute’s Lighting Research Center (LRC) and lead researcher on the new study. 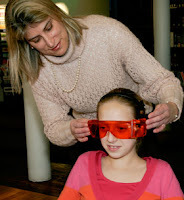 In the study just published in Neuroendocrinology Letters, Dr. Figueiro and LRC Director Dr. Mark Rea found that eleven 8th grade students who wore special glasses to prevent short-wavelength (blue) morning light from reaching their eyes experienced a 30-minute delay in sleep onset by the end of the 5-day study. “If you remove blue light in the morning, it delays the onset of melatonin, the hormone that indicates to the body when it’s nighttime,” explains Dr. Figueiro. “Our study shows melatonin onset was delayed by about 6 minutes each day the teens were restricted from blue light. Sleep onset typically occurs about 2 hours after melatonin onset." The problem is that today’s middle and high schools have rigid schedules requiring teenagers to be in school very early in the morning. These students are likely to miss the morning light because they are often traveling to and arriving at school before the sun is up or as it’s just rising. “This disrupts the connection between daily biological rhythms, called circadian rhythms, and the earth’s natural 24-hour light/dark cycle,” explains Dr. Figueiro. In addition, the schools are not likely providing adequate electric light or daylight to stimulate this biological or circadian system, which regulates body temperature, alertness, appetite, hormones and sleep patterns. Our biological system responds to light much differently than our visual system. It is much more sensitive to blue light. Therefore, having enough light in the classroom to read and study does not guarantee that there is sufficient light to stimulate our biological system. “According to our study, however, the situation in schools can be changed rapidly by the conscious delivery of daylight, which is saturated with short-wavelength, or blue, light,” reports Dr. Figueiro. Dr. Figueiro’s research, sponsored by the U.S. Green Building Council and in part by a grant from a Trans-National Institutes of Health Genes, Environment and Health Initiative is the first field study to measure the impact of reduced morning blue light exposure on evening melatonin onset of teenagers attending school. According to Dr. Figueiro, the results of this field study are significant because they validate controlled laboratory findings with actual field measurements of light that impact our biological system. The field experiment was conducted at Smith Middle School in Chapel Hill, North Carolina, a school with good daylight design. The school building has south-facing skylights to deliver daylight to nearly all interior spaces throughout the day. The study detailed in Neuroendocrinology Letters is part of a larger study where data on students was collected at both Smith Middle School in Chapel Hill, North Carolina, as well as Algonquin Middle School in Averill Park, New York. The larger study is examining not only the impact of removing morning blue light, but also the seasonal impact and the increased evening light exposure during the spring months on teens’ melatonin onset and sleep times. Throughout her research, Dr. Figueiro has repeatedly come face-to-face with the enormous concern of parents over teenagers going to bed too late. “Our findings pose two questions: “How will we promote exposure to morning light and how will we design schools differently?” says Dr. Figueiro. The study findings should have significant implications for school design. “Delivering daylight in schools may be a simple, non-pharmacological treatment for students to help them increase sleep duration,” concludes Dr. Figueiro. The new research has applications for more than 3 million shift workers and Alzheimer’s patients who suffer from lack of a regular sleep pattern. Studies have shown that this lack of synchronization between a shift worker’s rest and activity and light/dark patterns leads to a much higher risk of cardiovascular disease, diabetes, seasonal depression and cancer over decades. As evidenced in prior studies by Dr. Figueiro, light therapy can also be used to improve sleep in Alzheimer’s patients, who usually display uneven sleep patterns. “By removing light at certain times of day, and giving light at other times, you can synchronize the sleep/wake patterns of Alzheimer’s patients with the light/dark pattern, providing them with more consolidated sleep,” says Dr. Figueiro.